Norops sagrei (brown anole) can be identified by its extensible throat fan that is often coloured yellow or reddish-orange and has a white line down the centre of its back. Norops sagrei is a habitat generalist that prefers the open vegetation of disturbed sites. It is a ground dweller but will venture several feet up into trees and shrubs. 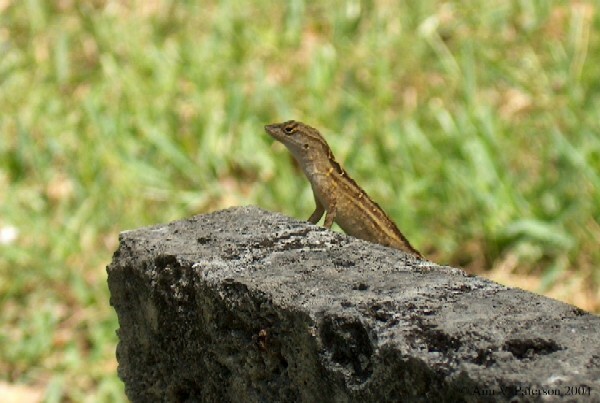 Norops sagrei compete with Anolis carolinensis and other introduced congeners. Norops sagre also prey on the hatchlings of Anolis carolinensis. Norops sagrei (brown anole) is a “trunk ground ecomorph” sensu (Williams, 1983). It is described as having an extensible throat fan that can be yellow to red-orange. This species can be between 13 and 21.3cm. It also has enlarged toe pads and a short snout (Campbell, 2002). 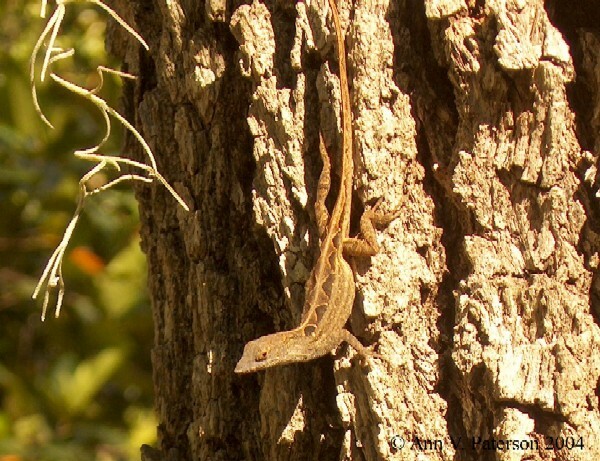 Brown anoles can erect a dorsonuchal crest when exposed to certain stimuli. The tail may have a crest-like ridge, but this is highly variable between individuals and should not be confused with the dorsonuchal crest. Also, the tail is laterally compressed. Females have a light line down the middle of their backs, but males do not. They tend to have a lighter mid-dorsal stripe that is distinct and often boldly patterned in females and often indistinct in males. Individuals change their colours and patterns throughout this range (Ann Paterson., pers. comm., 2005). Male colour is highly variable, ranging from light grey to nearly jet-black and plain coloured - to covered dorsally with irregular dark patches or chevrons and a network of light lines. Females exhibit a large range of colour, but nearly always have some type of obvious wavy dorsal pattern along the midline of their back (Enature.com Field Guide, undated). Tokarz et al. (2001) state that, \"The dewlap of N. sagrei is a relatively large and often brighly coloured throat skin that can be extended and retracted in a variety of visual displays.\" The dewlap is considered to be a sexually dimorphic trait in anoles because males in most species have a larger dewlap than females. Moreover, there is evidence that the sexes differ in at least some neural and other morphological features that are involved in display of the dewlap. The sexes also differ in the social context in which the dewlap is used. Males in agonistic interactions extend their dewlaps more frequently than females and, unlike females, also display the dewlap during courtship. It has been proposed that the display of the dewlap by males may play an important role in species recognition, female mate choice, male-male competition, and even predator deterrence (West -Eberhard, 1983). Wardle (2002) reports findings which show that on islands without Norops spp. there is a great magnitude of leaf damage to sea grape (Coccoloba uvifera L.) which is indicative of a lizard-induced trophic cascade. Norops sagrei (brown anole) is a ground dweller but will venture up several feet into trees and shrubs and prefers drier areas. Individuals occur primarily on the trunks of trees and on the ground (Rand and Williams, 1969). Campbell (2002) reports that the brown anole is a habitat generalist that generally prefers fairly open vegetation of disturbed sites. Adult Norops sagrei (brown anoles) breed during the summer months (Lee et al. 1989; Tokarz et al. 1998). It is not clear when they establish territories. Although they become more conspicuous during the breeding season, there have been no empirical tests to determine their degree of territoriality during the non-breeding season. It is not clear whether they cease to defend territories at the end of the breeding season (Ann Paterson., pers. comm., 2005). Campbell (2002) states that, \"Their native diet consists mainly of small arthropods, annelids, and molluscs.\"
Recommended citation: Global Invasive Species Database (2019) Species profile: Norops sagrei. Downloaded from http://www.iucngisd.org/gisd/speciesname/Norops+sagrei on 21-04-2019. The successful occupation of different types of habitats by Norops sagrei (brown anole) is attributed partly to its use of thermo-regulatory behaviours such as basking in solar radiation to select acceptable microclimates at different latitudes and altitudes (Rogowitz,1996). It is reported that brown anole when present, reduce the density and diversity of spiders upon which they feed (Wardle, 2002). Greene et al. 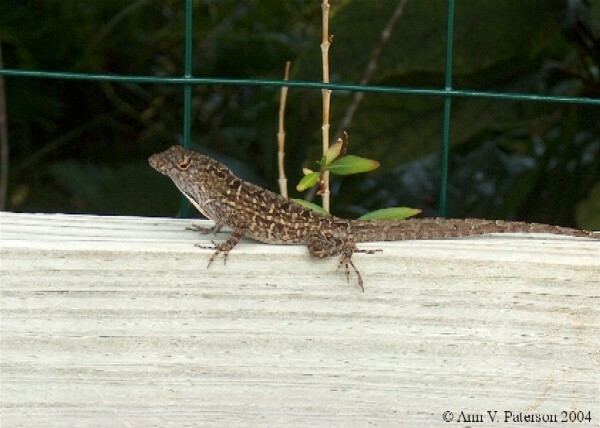 (2002) state that, brown anole competes successfully with native green anole (see Anolis carolinensis in IUCN Red List of Threatened Species) and other introduced congeners. Campbell (2002) observes that without the brown anole, the native green anole occupies perches from ground to crown, but the presence of the brown anole causes the green anole to move higher, occupying trunks and crowns of trees. Brown anole demonstrate intra-guild predation (IGP), which is defined as killing and eating among potential competitors and have been reported to prey on the hatchlings of green anole. N. sagrei have also been observed consuming hatchling brown anoles, although this behaviour is not well understood and it is not known whether this behaviour is common (Nicholson et al. 2000). 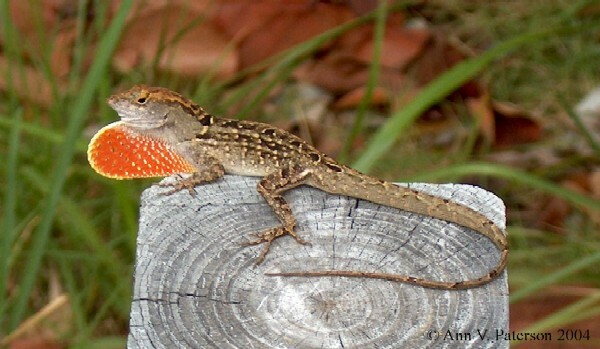 Campbell (2002) observes that, no control or eradication measures have been implemented for Norops sagrei (brown anole), in Florida (North America) where it has established. He further adds that this species would be very difficult if not impossible to completely eradicate due to its high density, high reproductive potential, and habitat generality. Informations on Norops sagrei has been recorded for the following locations. Click on the name for additional informations. Campbell, T. 2002. The Brown Anole (Anolis sagrei Dumeril and Bibron 1837). The Institute for Biological Invasions: The Invader of the Month, February 2001. Corkscrew Swamp Sanctuary. UNDATED. Brown Anole (exotic) Anolis sagrei sagrei. Audubon Centers and Sanctuaries: Corkscrew Swamp Sanctuary s Common Lizards. eNature.com, 2007. Brown Anole, Anolis sagrei. Field Guide to Reptiles and Amphibians [Online Database]. Frost, D.R. & Hammerson, G.A. 2007. Anolis carolinensis. In: IUCN 2007. 2007 IUCN Red List of Threatened Species. Greene, B. T., D. T. Yorks, J. S. Parmerlee, R. Powell, and R. W. Henderson. 2002. Discovery of Anolis Sagrei in Grenada with Comments on Its Potential Impact on Native Anoles. Carribean Journal of Science 38(3-4): 270-272. College of Arts and Sciences at the University of Puerto Rico. Bartareau, Tad M.; Leblanc, Lorrie A., 2006. Anolis sagrei (Cuban brown anole). Predation. Herpetological Review. 37(4). DEC 2006. 462. Campbell, Todd S., 1996. Northern range expansion of the brown anole (Anolis sagrei) in Florida and Georgia. Herpetological Review. 27(3). 1996. 155-157. Campbell, Todd S.; Gerber, Glenn P., 1996. Lacertilia: Anolis sagrei (brown anole): Saugrophagy. Herpetological Review. 27(4). 1996. 200. Gerber, Glenn P.; Echternacht, Arthur C., 2000. Evidence for asymmetrical intraguild predation between native and introduced Anolis lizards. Oecologia (Berlin). 124(4). September, 2000. 599-607. Gerrut, N., J. J. Mao, H. P. Chu, and L. C. Chen. 2002. A new record of an introduced species, the brown anole (Anolis sagrei) (Dumeril and Bibron, 1837), in Taiwan. Zoological Studies 41(3): 332-336. Summary: An account of species sighting in Taiwan. Goldberg R. S., C. R. Bursey, and F. Kraus. 2002. Seasonal Variation in the Helminth Community of the Brown Anole, Anolis sagrei (Sauria: Polychrotidae), from Oahu, Hawaii. American Midland Naturalist 148:409-415. Henderson, Robert W.; Powell, Robert, 2005. Anolis sagrei (Brown Anole). Herpetological Review. 36(4). DEC 2005. 467. Huang, Shao-Chang; Norval, Gerrut; Tso, I-Min., 2008. Predation by an exotic lizard, Anolis sagrei, alters the ant community structure in betelnut palm plantations in Southern Taiwan. Ecological Entomology. 33(5). OCT 2008. 569-576. Kolbe, Jason J.; Larson, Allan; Losos, Jonathan B., 2007. Differential admixture shapes morphological variation among invasive populations of the lizard Anolis sagrei. Molecular Ecology. 16(8). APR 2007. 1579-1591. Landwer, Allan J.; Ferguson, Gary W., 2002. 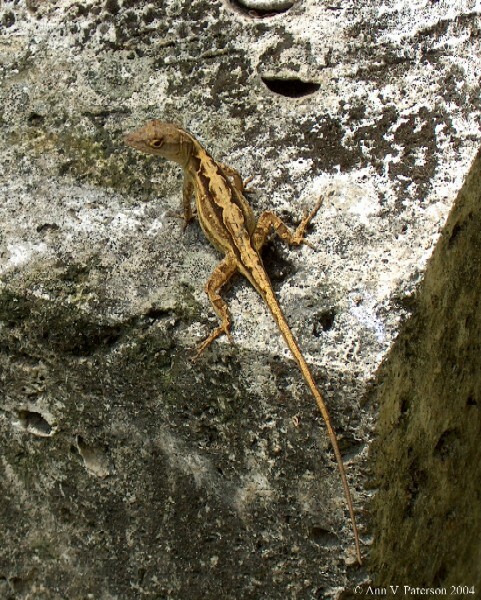 Long-term structural habitat use of male individuals of two native and one introduced Anolis (Iguanidae) species on the north coast of Jamaica. Texas Journal of Science. 54(1). February, 2002. 51-58. Landwer, Allan J.; Ferguson, Gary W.; Herber, Rick; Brewer, Mark, 1995. Habitat use of introduced and native anoles (Iguanidae: Anolis) along the northern coast of Jamaica. Texas Journal of Science. 47(1). 1995. 45-52. Lee J. C.; Clayton D.; Eisentein S.; Perez I., 1989. The Reproductive Cycle of Anolis sagrei in Southern Florida USA. Copeia.(4). 1989. 930-937. Lee, J. C., D. Clayton, S. Eisenstein, and I. Perez. 1989. The reproductive cycle of Anolis sagrei in southern Florida. Copeia 1989:930�937. McMann S. 2000. Effects of residence time on displays during territory establishment in a lizard. Animal Behavior 59:513-522. Summary: A study detailing reproductive aspects of species. Nicholson, K.E., A.V. Paterson, and P.M. Richards., 2000. Anolis sagrei (brown anole) cannibalism. Herpetological Review 31(3):173-174. Nicholson, Kirsten E.; Paterson, Ann V.; Richards, Paul M., 2000. Anolis sagrei (Brown Anole). Cannibalism. Herpetological Review. 31(3). September, 2000. 173-174. Norval, Gerrut, 2007. A report on male Anolis sagrei saurophagy in Chiayi County, Taiwan. Herpetological Bulletin.(102). WIN 2007. 34-37. Norval, Gerrut; Bursey, Charles R.; Goldberg, Stephen R.; Tung, Chun-Liang; Mao, Jean-Jay, 2009. Norops sagrei (Brown Anole) Pathology and Endoparasite. Herpetological Bulletin.(107). SEP 2009. 42-44. Norval, Gerrut; Huang, Shao-Chang; Mao, Jean-Jay, 2007. Mountain wolf snake (Lycodon r. ruhstrati) predation on an exotic lizard, Anolis sagrei, in Chiayi County, Taiwan. Herpetological Bulletin.(101). FAL 2007. 13-17. Summary: The Mountain wolf snake (Lycodon ruhstrati ruhstrati) is a common snake species at low elevations all over Taiwan. Still, it appears to be poorly studied in Taiwan and adjacent areas since little has been reported about this species. On 2611, August 2002 ten L. r. ruhstrati eggs were obtained from an adult female, one of two that were caught a day before, and eight of the eggs hatched successfully on 1411 October 2002. While in captivity all the adults preyed upon A nolis sagrei, which were given to them as prey, while two neonates accepted A. sagrei hatchlings offered to them as food. On February 1811,, 2006, a DOR Mountain wolf snake, with an A. sagrei in its stomach, was found on a tarred road in Santzepu, Sheishan District, Chiayi County. This appears to be the first report from Taiwan of the Mountain wolf snake (L. r. ruhstrati) preying on the exotic introduced lizard A. sagrei. Powell, Robert; Henderson, Robert W., 2007. The St. Vincent (Lesser antilles) herpetofauna: Conservation concerns. Applied Herpetology 4(4). 2007. 295-312. Rodriguez Schettino, Lourdes; De Queiroz, Kevin, 2002. Anolis sagrei sagrei (cuban brown lizard; chino; torito). Habitat use and thermal biology. Herpetological Review. 33(4). December 2002. 305. Rogowitz, G. L. 1996. Evaluation of Thermal acclimation of Metabolism in Two Eurythermal Lozards, Anolis cristatellus and A. sagrei. Journal of Thermal Biology 21(1): 11-14. Summary: A research paper that analyzes the adaptive abilities of the species. Schoener, Thomas W.; Jonathan B. Losos and David A. Spiller, 2005. Island Biogeography of Population: an introduced species transforms survival pattern (Report) Science 310.5755 (Dec 16, 2005): p1807(3). Skelton, Chris; Parmley, Dennis, 2005. Anolis sagrei: (Brown Anole). Herpetological Review. 36(4). DEC 2005. 467. Tokarz, R. R. 1995. Importance of androgens in male territorial acquisition in the lizard Anolis sagrei: an experimental test. Animal Behavior 49: 661-669. Tokarz, R. R., S. McMann, L. C. Smith, and H. J. Alder. 2002. Effects of Testosterone Treatment and Season on the Frequency of Dewlap Extensions during Male-Male Interactions in the Lizard Anolis sagrei. Hormones and Behavior 41: 70-79. Tokarz, R. R., S. McMann, L. Seitz, and H. John-Alder. 1998. Plasma corticosterone and testosterone levels during the annual reproductive cycle of male brown anoles (Anolis sagrei). Physiological Zoology 71:139�146. Townsend, H. Josiah; Kenneth L. Krysko; Anthony T. Reppas and Coleman M. Sheehay III., 2002. Noteworthy Records for Introduced Reptiles and Amphibians from Florida, USA. Herpetological Review, 2002, 33(1), 75. Treglia, Michael L.; Muensch, Alexander J.; Powell, Robert; Parmerlee, John S. Jr., 2008. Invasive Anolis sagrei on St. Vincent and its potential impact on perch heights of Anolis trinitatis. Caribbean Journal of Science. 44(2). 2008. 251-256. Wardle, D. A. 2002. Islands as model system for understanding how species affect ecosystem properties. Journal of Biogeography 29:583-591. Williams, E. E., 1983. Ecomorphs, faunas, island size, and diverse endpoints in island radiations of Anolis. In R. B. Huey, E. R. Pianka, and T. W. Schoener (eds. ), Lizard Ecology: Studies of A Model Organism. pp. 326-370. Harvard University Press, Cambridge, Massachusetts.